Begin your 1-hour, UW Sailgate Cruise aboard the Rainbird at centrally located Pocock Rowing Center, adjacent to Portage Bay Park, featuring easy access and ample parking. Depart amid floating homes, and all manner of watercraft ranging from canoes, sailboats, classic wooden boats, and motor boats, to mega yachts and float planes. 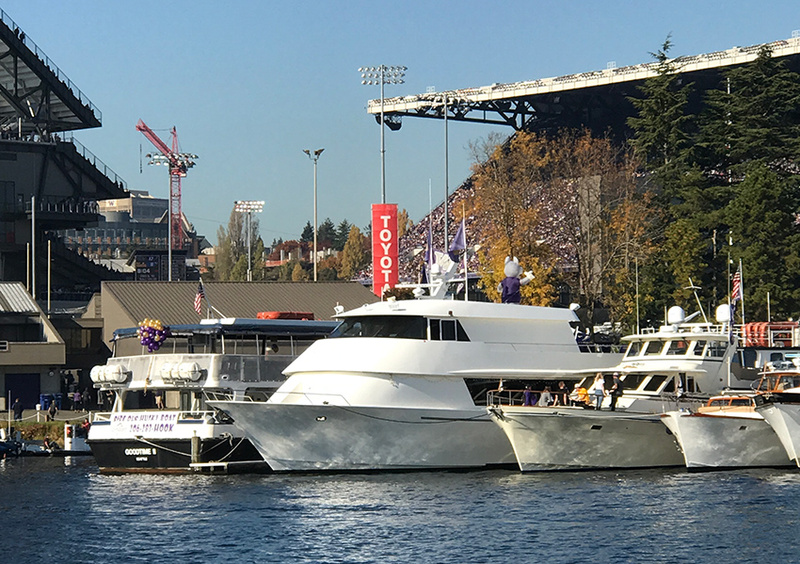 Your 1-hour, UW Sailgate Cruise begins by heading to the south side of Lake Union where major companies are reshaping our city. We’ll leave the hustle and bustle behind as we set out on our leisurely cruise in the comfort of our beautiful custom and classic wooden yacht. We then will either drop you off at the Southeast Entrance of Alaska Airlines Stadium, or you can stay aboard and enjoy the game on two big screens. If you departed the boat, we will pick you up after the game, and take you back to our dock, where you can return to your vehicle or jump back on a train or bus. 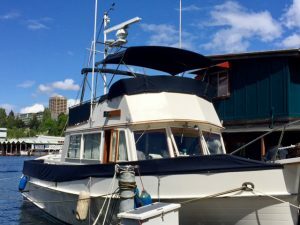 • Stay aboard the Rainbird and enjoy the games on 2-50 inch, big screen TVs, while anchored up just east of the stadium, along with all of the other Sailgaters. Watch the game in the privacy and comfort of the Rainbird, while listening to the roar of the stadium crowd.